Dan Hawk's comedy hypnosis shows are second to none! He'll invite volunteers onto the stage to go on an amazing journey in their own subconscious minds. His hilarious comedy routines with the volunteers' antics on stage will leave you rolling in the aisles. It's entertainment unlike any other! 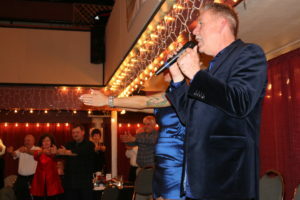 A comedy hypnosis show by Dan Hawk is a great way to bring premium entertainment to your event. Not only are the shows really funny, they're also unique every time. At each show, you'll see new volunteers and new routines, so every performance is different. Dan is constantly updating his shows with new routines and music to make sure they're up to date, relevant, and most of all, funny! See the show or be the show. You'll have a great time either way! Choose to become a part of the show yourself and discover the amazing power of your own mind...or, watch from the audience as your friends and colleagues do silly and hilarious things on stage! Dan's goal is to entertain and empower, not embarrass, so he'll ensure that each and every volunteer on stage is treated with respect and has a wonderful time. He also ensures that the content is appropriate for your group. His shows can be customized for your event as well so that you look like a hero for booking him! Book with the confidence that you'll get stellar entertainment that will truly Awaken the Star Within. Dan Hawk's comedy hypnosis shows get rave reviews from groups all over the country! His unique combination of comedy and a message will really show your guests what they're capable of. Don't miss out on this one-of-a-kind presentation! Whether you're looking for entertainment for your next school event, corporate party or banquet, or more, Dan Hawk will provide entertainment that you'll never forget! Contact Dan today to find out more!